As the medical profession developed in the nineteenth century, the centres of growing medical power were the hospitals and their clinics. They developed the foundations of medical science, on which the new profession depended, and taught future generations of doctors. Typical of these re-invented institutions was the Salpêtrière (now Pitié-Salpêtrière) Hospital in Paris. Initially a gunpowder factory, it was turned into a hospice for poor women in 1656, and by the end of the eighteenth century was the largest hospital in the world, capable of containing over ten thousand patients, although few received any real medical care. During the nineteenth century, this huge hospital specialised in nervous disorders and psychiatric conditions. 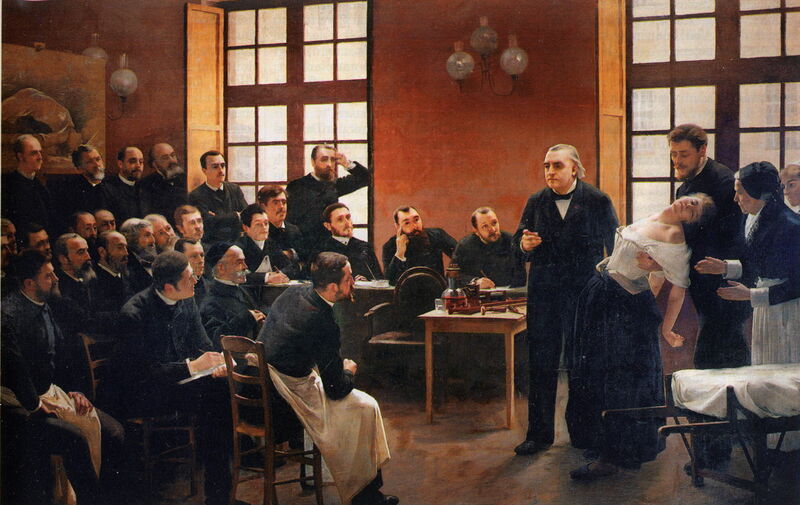 In André Brouillet’s A Clinical Lesson at the Salpêtrière Hospital (1887), its eminent neurologist Jean-Martin Charcot is demonstrating how he could hypnotise Marie “Blanche” Wittman, the ‘Queen of Hysterics’, into suffering hysterical collapse. Charcot and Wittman were a renowned partnership in this ‘act’, who performed in front of Sigmund Freud when he visited the hospital. The composition is radically different from those of doctors visiting patients in their own home. There are 28 men and three women present. Dominating the work is the figure of Charcot, who looks not at his ‘patient’, but at his audience. Care of his patient is left to Dr Joseph Babinski and the two nurses at the extreme right. The patient is a woman, the least dressed of all those present, passive, and unconscious. The distinguished members of Charcot’s audience are looking not at Wittman and her collapse, but at Charcot, the star performer. Over at the Hôpital Saint-Louis, also in Paris and founded in 1607 during an outbreak of plague, another eminent doctor is teaching in Henri Gervex’s Before the Operation. Dr Péan is one of the eight men and three women present, and dominates the composition as he looks somewhat distantly to the right of the painting. His patient is a woman, who lies there naked and unconscious. Only one person is looking at her, as the others are all looking at one another. Ilya Repin (1844–1930), The Surgeon Evgueni Vasilievich Pavlov in the Operating Theatre (1888), oil on canvas, 27.8 x 40.3 cm, The State Tretyakov Gallery, Moscow, Russia. Wikimedia Commons. 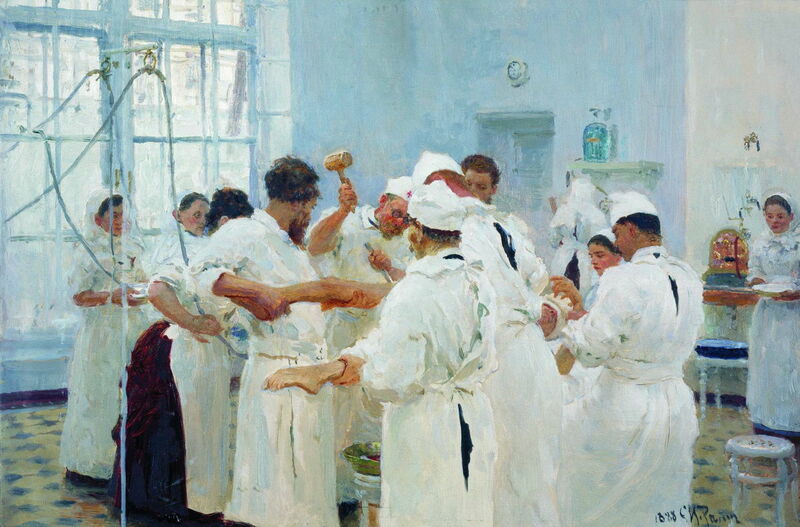 Ilya Repin’s painting of The Surgeon Evgueni Vasilievich Pavlov in the Operating Theatre (1888) shows an eminent Russian surgeon at work in the operating theatre, wielding a hammer and chisel on an anaesthetised patient’s leg. The painting is dominated by the dazzling white operating gowns of those at work, and the slightly less intense pale blue of the surrounding walls. The patient can hardly be seen, only their lower legs which are held by assistants, and part of their face. In addition to the patient, who is unconscious and of indeterminate gender, there are six men and five women present. 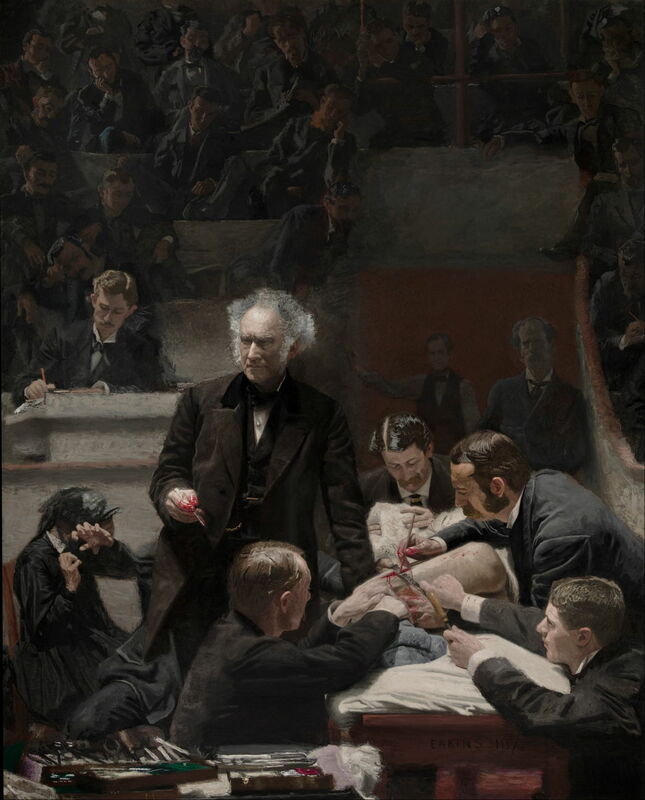 Thomas Eakins has the distinction of having painted two major works showing surgical procedures which, for someone who was not a war artist, appears unique. Thomas Eakins (1844–1916), Portrait of Dr. Samuel D. Gross (The Gross Clinic) (1875), oil on canvas, 244 x 198.3 cm, Philadelphia Museum of Art, Philadelphia, PA. Wikimedia Commons. His first, the Portrait of Dr. Samuel D. Gross (The Gross Clinic) from 1875, has remarkable compositional similarities with those of Gervex and Brouillet above. Gross stands in dominance in the middle of the painting, a scalpel held in his bloodied right fingers. He not only looks away from his patient, but appears completely detached. 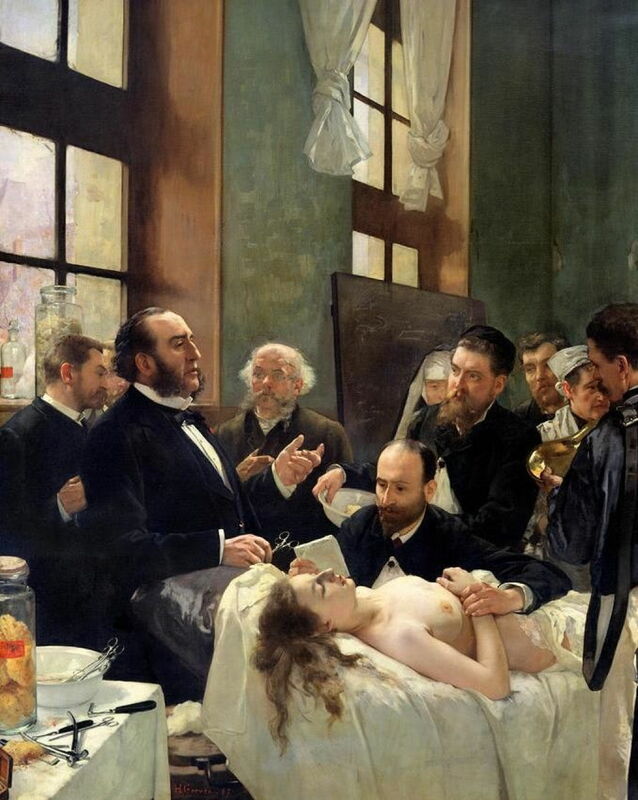 Behind and to the left is the only woman in the painting: not a nurse, but apparently the patient’s distressed mother. The patient, lying with their feet towards the viewer and their head under the anaethetist’s mask, is of indeterminate gender, and is unconscious thanks to the effects of either ether or chloroform. Gross looks like an actor on a stage, surrounded by his audience, who appear similarly disinterested in the patient. It is left to Gross’s four assistants to get on with the operation. 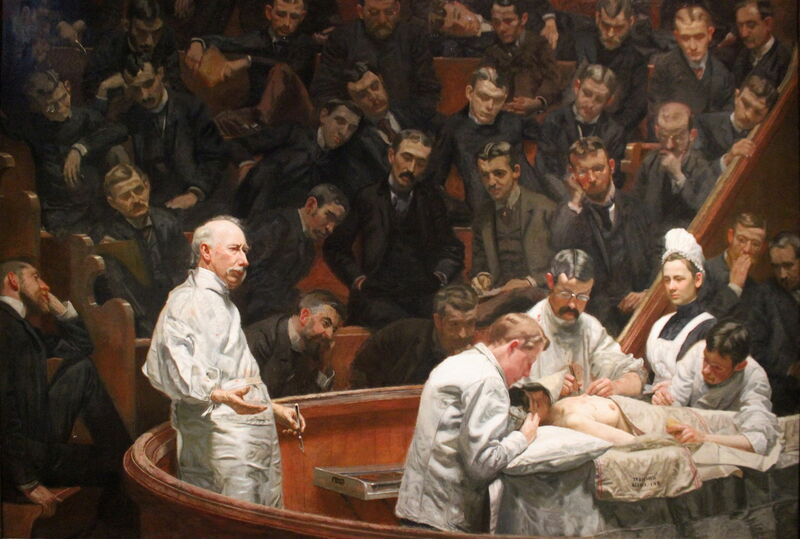 Over ten years later, Eakins painted the retiring professor of surgery, Dr. David Hayes Agnew, at work in the University of Pennsylvania School of Medicine. Superficially it may appear similar to his earlier painting, but it has a very different composition. The patient is a woman, who is partially naked and unconscious thanks to a volatile liquid general anaesthetic administered via a mask. Bright surgical lighting puts six figures literally in the limelight: Agnew, holding a scalpel at the left but appearing detached from the operation; three assistants who are attending to the patient and her surgery, and the only woman present (other than the patient), nurse Mary Clymer, who is dressed not for the operating theatre but for ward work. This group is shown in the spotlight on stage, but the audience is here paying particular attention to the patient, rather than the teacher. Robert C. Hinckley (1853–1941), Ether Day, or The First Operation with Ether (1882-93), oil on canvas, 243.8 x 292.1 cm, Francis A. Countway Library of Medicine, Harvard University, Cambridge, MA. Wikimedia Commons. Prior to the introduction of general anaesthesia, surgical procedures were severely limited in what they could tackle. 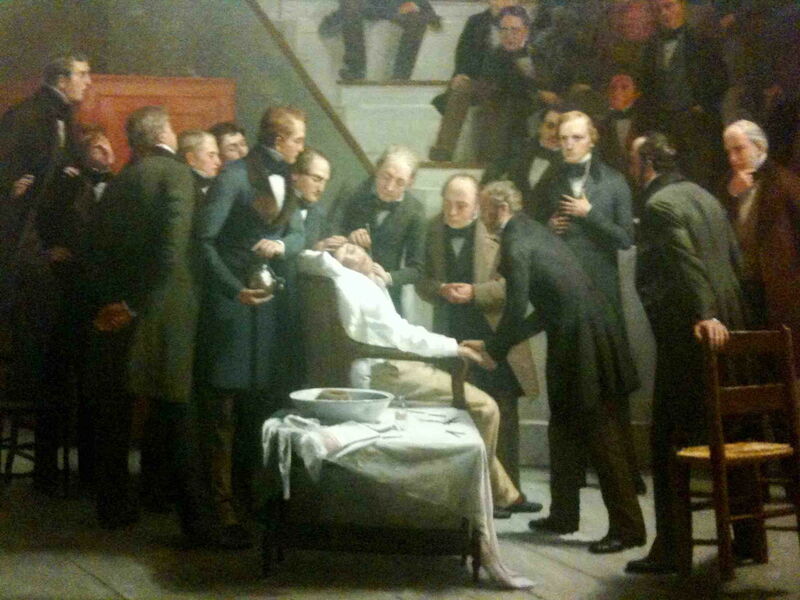 Robert C. Hinckley’s Ether Day, or The First Operation with Ether, painted some time between 1882-93, recreates the scene on 16 October 1846 in what is now known as the Ether Dome in the Massachusetts General Hospital, Boston, MA. Here John Collins Warren is removing a tumour from the neck of a local printer, Edward G Abbott, who was anaesthetised using ether – its first recorded use for a general surgical procedure. Although the quality of this image is not good, its composition is still clear. The patient is a man seated upright in a chair, but anaesthetised and unconscious. He, and the surgery taking place on his neck, is the centre of the painting, and of attention of almost all those present. Only one person stands to the right of centre, apparently looking at the viewer rather than the patient. Now mainly remembered for his paintings of the First World War and his teaching, Henry Tonks trained and practised as a surgeon until he was appointed Slade Professor of Fine Art in London in 1892. As far as I am aware, he is the only significant painter to have changed professions in this way, although many artists have started training as doctors before switching to art. When war broke out in 1914, Tonks returned to medicine, first in England, then the following year he served as a medical orderly on the Marne, in France, where he used his pastels to paint Saline Infusion: An incident in the British Red Cross Hospital, Arc-en-Barrois, 1915. Saline intravenous infusions were still relatively novel at that time, and war surgery was busy re-learning many of the lessons of the past. Tonks preserved the anonymity of his models although his drawing is otherwise anatomically precise – as would be expected of a former teacher of anatomy. 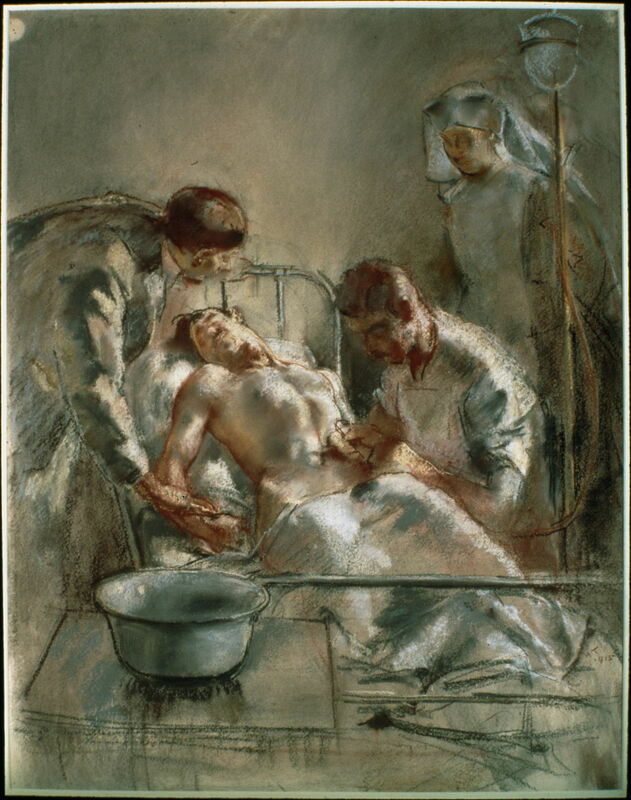 Tonks shows the patient at the centre of his three carers, of whom one is a nurse. The two male carers, probably doctors, are both in physical contact with the patient. The man on the left is holding the patient’s hand, while the other is inserting the cannula for the intra-venous infusion, a delicate task which would have been unfamiliar at the time. Oddly, it is the nurse who is most detached. The medicalisation of life was incomplete without the medicalisation of death. 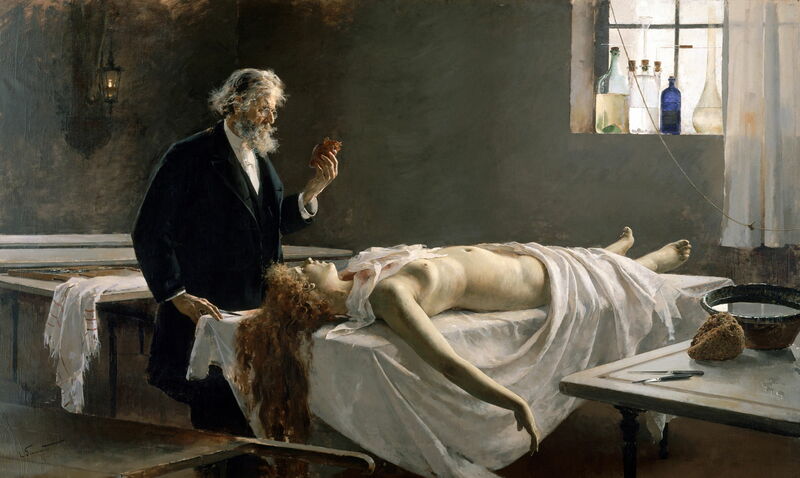 Enrique Simonet’s unique painting of The Autopsy, also known as Anatomy of the Heart; She had a Heart! (1890), shows the largely exposed body of a young woman who had drowned herself. A well-dressed male pathologist stands by her head, holding in his left hand her heart, which he has apparently just removed. There are no spectators other than the viewer. From so few paintings, it is perhaps dangerous to draw any conclusions, but there may be a trend away from the practice and teaching of medicine as an exhibition or performance, to more patient-oriented care. At the same time, its treatment in painting has moved away from the clinic as spectacle, and looked more at the effects of illness on the patient. Posted in General, Life, Painting and tagged Brouillet, Eakins, Gervex, Hinckley, painting, Repin, Simonet, Tonks. Bookmark the permalink. I liked this a lot. I am reminded of the much earlier, Anatomy Lesson of Dr. Tulp, by Rembrandt 1632. Amazing, as well for its early-ness. But I think you are probably focusing on the living patient. I was tempted to include some more post-mortem/anatomist paintings such as that wonderful Rembrandt, but there are quite a lot of them, and they follow a rather different thread. I hope to cover those another time.